Family of Ronen Lubarsky hails decision to demolish terrorist's house but intends boycotting murderer's trial. The father of Duvdevan fighter Ronen Lubarsky responds on Arutz Sheva to the approval given by the Supreme Court to demolish all four floors in the house of the terrorist who murdered his son in May 2018. "On the one hand, we're happy that sanity has prevailed and they decided to demolish the house, and we hope it'll bring to destroying the homes of other terrorists. 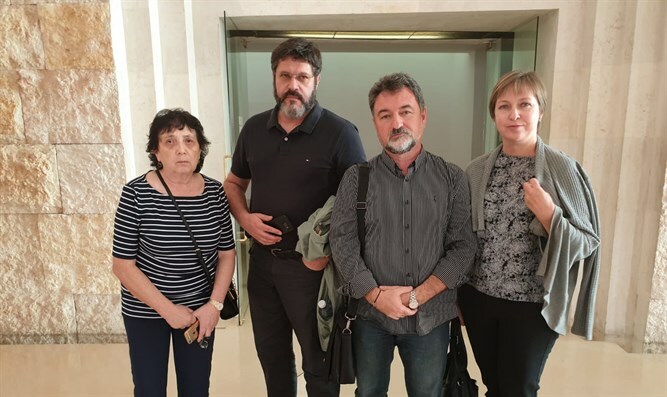 But on the other hand we've encountered a cold hand from the justice system that treats the terrorists as equal citizens," says bereaved father Vlodomir. "I wrote a letter to the Central Regional Commander after the terrorist's house wasn't destroyed for a long time, and from the point of view of the Supreme Court justices, my letter was grounds for disqualifying the Commander who 'might have been influenced by extraneous considerations'; it's insane." Lubarsky states that in the State of Israel families of terrorists and the terrorists themselves are pampered by the legal system: "The terrorists turn to the courts who hear their petitions, and I ask why they have these rights; why don't they reject them out of hand? Why is the house of the Barkan terrorist's family still standing?" The bereaved family does not have faith in the legal system and intends to boycott the murderer's trial. "We demanded the death penalty but they spat in our faces and appointed us a group of judges who won't mete the death penalty. This is a scandal that even before the trial began marked the direction of the decision and turned this sentence into a farce, so we're boycotting the trial because we don't believe in the legal system." Lubarsky hopes Israel will know how to formulate a "deterrent package" against terrorists that includes "the death penalty, expelling families, and demolishing homes. I don't buy what some say that the death penalty isn't a deterrent; it's a bunch of nonsense. If those terrorists who go to attack want to be martyrs then they'd keep killing until they were killed, but they kill and run because they know they'll be caught and not killed and they won't receive the death penalty but sit with their friends in prison under good conditions." B'Tzalmo organization Director Shai Glick, who accompanied the Lubarsky family in the legal battle, said "We welcome the Supreme Court decision, but are pained that it took more than half-a-year to make such a clear decision. We demand the IDF demolish the rest of the 101 houses of terrorists that were measured and not destroyed. Destroying terrorists' homes saves lives and is now legally authorized."